The Ultimate Budget Ukulele Hanger! Free to those with shoelaces… The Uke Sling from UK Ukee. Ukulele Set-up – Turn your budget Uke into a playable musical instrument comparable to the higher end entry-level ukulele on the market! 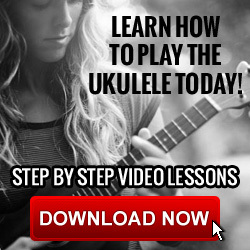 Give your new ukulele a lower action & vintage playability! Intonation Correction – Reduce sharp notes at the first fret & correct intonation issues throughout the fretboard by: lowering action & fret levelling. Producing uniformed, dressed/crowned frets. Rejuvenate & Maintain – Repair or replace minor damage & old worn parts. Clean & maintain the frets & fretboard, dress/crown to give smooth frets & fret ends then polish to make them shine! Ukulele Maps – Find your nearest ukulele group, jam, club, band, association or even orchestra in UK, Europe, USA & Canada. Ukulele Luthier Interviews – Stories of ukulele luthier’s journeys from around the world, including insightful tips and tool advice for the aspiring luthier. Ukulele Build – Find tutorials and plans for various different sizes and styles of ukulele, advice and guidance from professionals is also available.